Ebrahimi, M., Danaee, I., Eskandari, H., Nikmanesh, S. (2017). Corrosion Resistance and Semiconducting Properties of the Passive Films on Duplex Stainless Steel 2205. International Journal of Iron & Steel Society of Iran, 14(2), 9-15. M. Ebrahimi; Iman Danaee; H. Eskandari; S. Nikmanesh. "Corrosion Resistance and Semiconducting Properties of the Passive Films on Duplex Stainless Steel 2205". 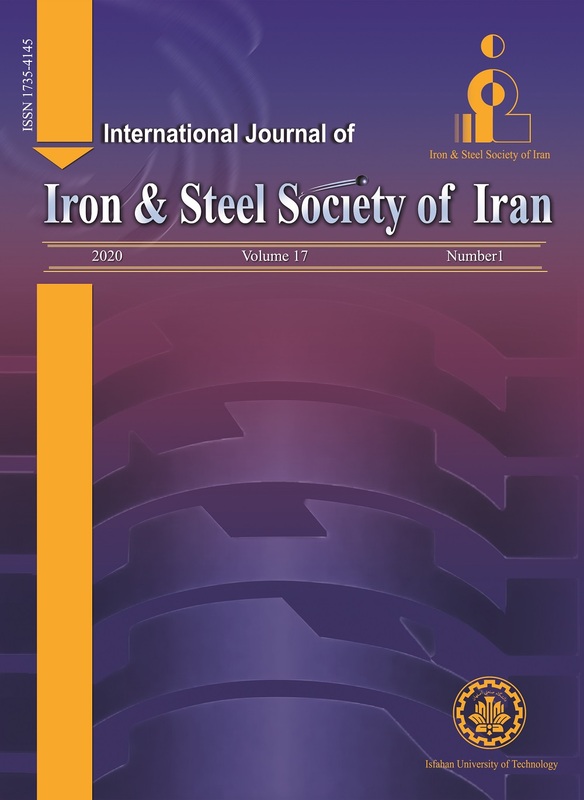 International Journal of Iron & Steel Society of Iran, 14, 2, 2017, 9-15. Ebrahimi, M., Danaee, I., Eskandari, H., Nikmanesh, S. (2017). 'Corrosion Resistance and Semiconducting Properties of the Passive Films on Duplex Stainless Steel 2205', International Journal of Iron & Steel Society of Iran, 14(2), pp. 9-15. Ebrahimi, M., Danaee, I., Eskandari, H., Nikmanesh, S. Corrosion Resistance and Semiconducting Properties of the Passive Films on Duplex Stainless Steel 2205. International Journal of Iron & Steel Society of Iran, 2017; 14(2): 9-15. In this study, the effect of molybdate on the electrochemical behavior and semi-conductive properties of duplex stainless steel 2205 passive film at NaCl solutions was investigated. Cyclic potentiodynamic polarization, impedance spectroscopy, mott-schottky plots and scanning electron microscopy (SEM) were used to study the passive behavior. Polarization curves showed that the corrosion current and passive current density of stainless steel decreased with increasing molybdate concentrations. Mott–Schottky analysis revealed that the passive films formed on duplex stainless steels behave as n-type and p-type semiconductors and the donor and acceptor densities reduced with increasing molybdate concentration. Electrochemical impedance spectroscopy (EIS) results showed that charge transfer and passive resistance increased in the presence of molybdate. In addition, double layer and film capacitance decreased with increasing molybdate concentration and passive film thickness increased. Scanning electron microscopy was used to study the steel surface and showed more uniform surface with lower damage in the presence of molybdate. A. Igual Muñoz, J. García Antón, S. López Nuévalos, J. L. Guiñón and V. Pérez Herranz: Corros. Sci., 46(2004), 2955. H. Luo, C. F. Dong, K. Xiao and X. G. Li: Appl. Surf. Sci., 258(2011), 631. R. M. Fernández-Domene, E. Blasco-Tamarit, D. M. García-García and J. García-Antón: Electrochim. Acta., 95(2013), 1. H. Luo, H. Su, C. Dong, K. Xiao and X. Li: Data Br., 5(2015), 171. H. Li, Z. Jiang, H. Feng, S. Zhang, P. Han, W. Zhang and G. Li: Int. J. Electrochem. Sci., 10(2015), 4832. J. Huang, X. Wu and E.-H. Han: Corros. Sci., 51(2009), 2976. S. Jin and A. Atrens: Appl. Phys. A Solids Surf., 42(1987), 149. H.-H. Ge, X.-M. Xu, L. Zhao, F. Song, J. Shen and G.-D. Zhou: J. Appl. Electrochem., 41(2011), 519. N. Sato: J. Electrochem. Soc., 129(1982), 255. G. Bianchi, A. Cerquetti, F. Mazza and S. Torchio: Corros. Sci., 12(1972), 495. F. Eghbali, M. H. Moayed, A. Davoodi and N. Ebrahimi: Corros. Sci., 53(2011), 513. L. Freire, M. J. Carmezim, M. G. S. Ferreira and M. F. Montemor: Electrochim. Acta., 55(2010), 6174. M. BenSalah, R. Sabot, E. Triki, L. Dhouibi, Ph. Refait and M. Jeannin: Corros. Sci., 86(2014), 61. D.G. Li, J.D. Wang, D.R. Chen and P. Liang: J. Power Sources., 272(2014), 448. L. Jinlong, L. Tongxiang, W. Chen and D. Limin: J. Electroanal. Chem., 757(2015), 263. F. Mao, C. Dong and D. D. Macdonald: Corros. Sci., 98(2015), 192. Y. S. Kim: Met. Mater., 4(1998), 183. G.O. Ilevbare and G.T. Burstein: Corros. Sci., 45(2005), 1545. K. Sugimoto and Y. Sawada: Corrosion, 32(1976), 347. M. D. Krotova, Yu. V. Pleskov, A. A. Khomich, V. G. Ralchenko, D. N. Sovyk and V. A. Kazakov: Russ. J. Electrochem., 50(2014), 101. F. La Mantia, H. Habazaki, M. Santamaria and F. Di Quarto: Russ. J. Electrochem., 46(2010), 1306. J. Ding, L. Zhang, M. Lu, J. Wang, Z. Wen and W. Hao: Appl. Surf. Sci., 289(2014), 33. C. Escrivà-Cerdán, E. Blasco-Tamarit, D.M. García-García, J. García-Antóna and A. Guenbour: Electrochim. Acta, 80(2012), 248. N. Sato: Corros. Sci., 31(1990), 1. J. Lv, T. Liang, C. Wang and T. Guo: J. Alloys Comp., 658(2016), 657. H. Luo, H. Su, C. Dong and X. Li: Appl. Surf. Sci., 400(2017), 38. E.E. Oguzie, J. Li, Y. Liu, D. Chen, Y. Li, K. Yang and F. Wang: Electrochim. Acta., 55(2010), 5028. D. G. Li, J. D. Wang, D. R. Chen and P. Liang: Int. J. Hydrogen Energy., 40(2015), 5947. B. M. Larkin and I. L. Rozenfeld: Prot. Metals.,17(1981), 408.